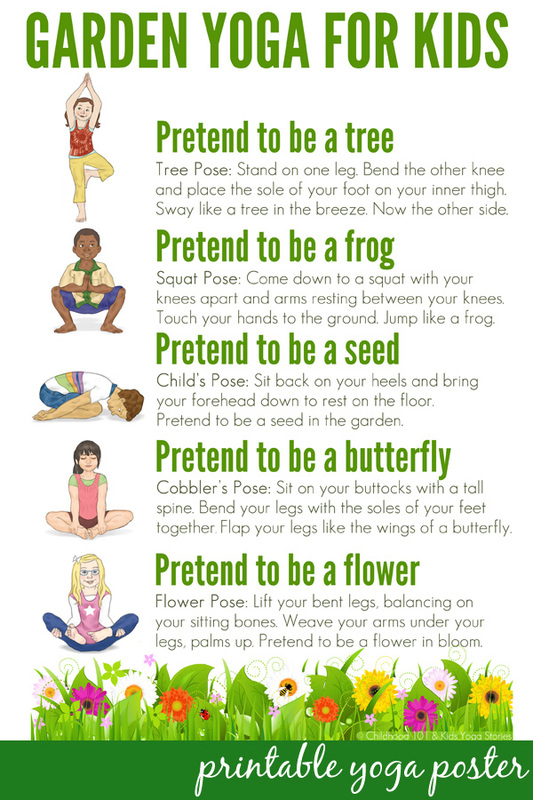 This garden themed yoga for kids sequence is a fabulous way to celebrate the changing seasons, being out in nature or Earth Day. It is also simple to use movement to teach your children about the garden. Children are born to move. They need to move to learn, be active, and have fun! 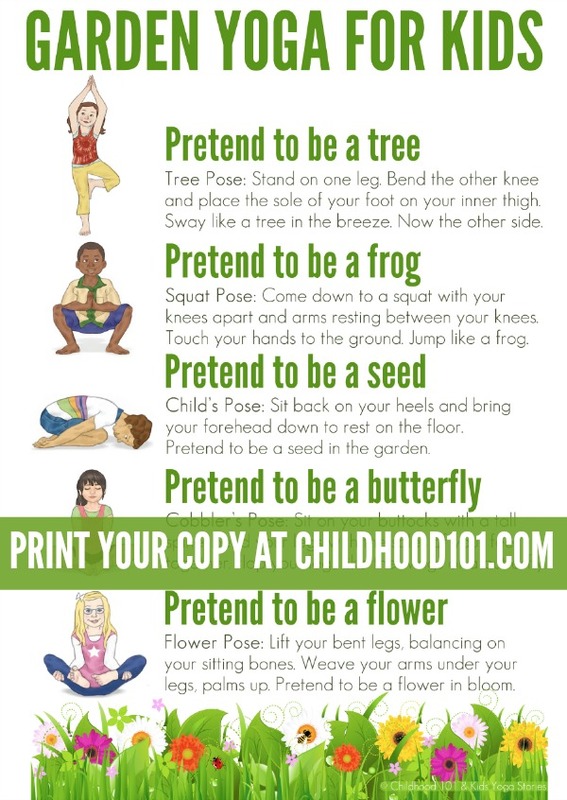 This garden themed yoga for kids sequence can easily be used at home or school, simply print our our the printable version (download instructions below) to guide you. To get started, clear a space so the children can move around safely, without bumping into any obstacles. Have your little gardeners wear comfy clothes perfect for gardening. They could practice on a yoga mat—or on a towel if you’re on a non-slip surface—pretending the mat is their garden. Explain that you’re going on a pretend walk through the garden and remind them to bring their creativity and imaginations! Follow along with the five garden yoga poses below. Don’t worry about practicing the perfect yoga postures. Just give it a go and have fun! Stand on one leg. Bend the knee of the leg you are not standing on, place the sole of your foot on the opposite inner thigh or calf, and balance. Sway like a tree in the breeze. Switch sides and repeat the steps. Come down to a squat with your knees apart and your arms resting between your knees. Touch your hands to the ground. Jump up like a frog and then return to a squat position. Sit back on your heels, slowly bring your forehead down to rest on the floor in front of your knees, rest your arms down alongside your body, and take a few deep breaths. Pretend to be a seed in the garden. Gently come up and sit on your buttocks with a tall spine. Bend your legs, place the soles of your feet together, and gently flap your legs like the wings of a butterfly. From Cobbler’s Pose, lift your bent legs, balance on your sitting bones, and weave your arms under your legs with your palms facing up. Pretend to be a blossoming flower. Finish your garden yoga experience by lying on your back with your arms and legs spread out in a Resting Pose. Close your eyes (if that’s comfortable) and take a few deep breaths. Think about what you love about gardens and maybe imagine a rainbow arching across the sky above you. To extend your yoga experience, you can also make your own list of garden visuals and use our list of Yoga Poses for Kids to find matching yoga poses. 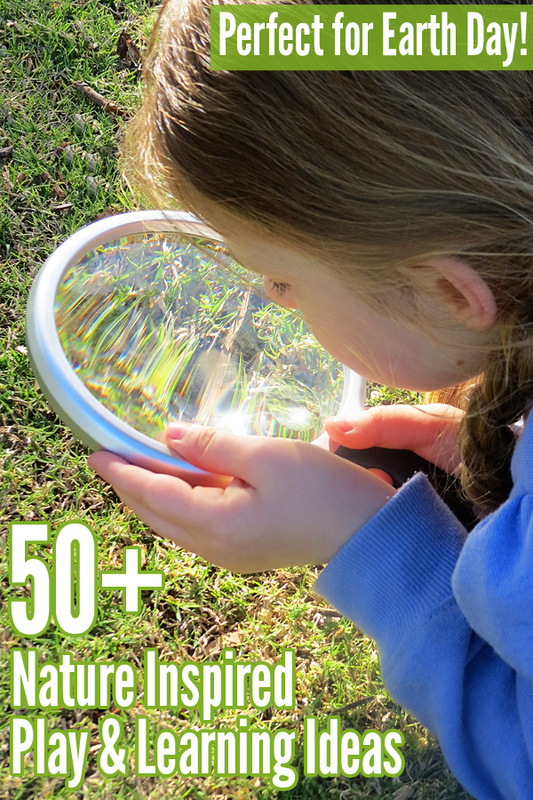 Think of things like the sun, rain, a rainbow, a tree, plants, flowers, rocks, birds, butterflies, bees, caterpillars, a wheelbarrow, frogs, ladybugs, dragonflies, or seeds. As the parent or teacher, join in the garden yoga by hopping like a frog, fluttering like a butterfly, and crawling like a caterpillar. You might be surprised how fun it is! In fact, why not grab your friends and family to create a community yoga garden! 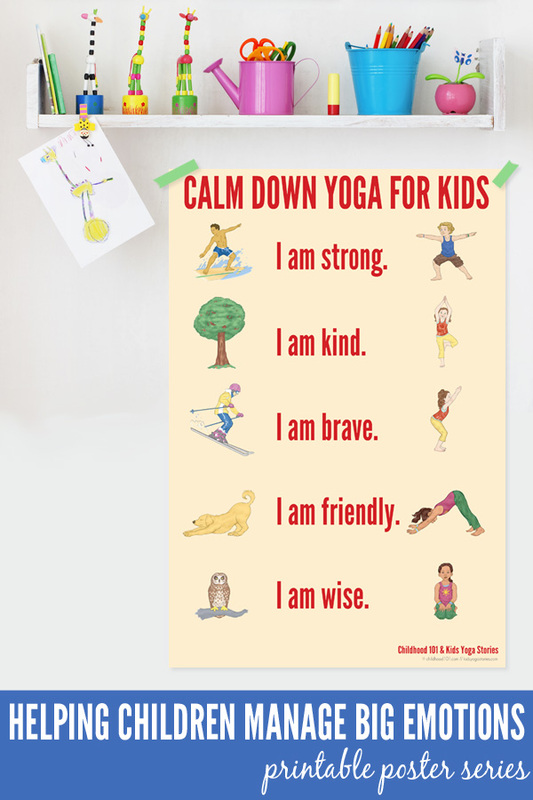 Click here to save the download to your computer: Garden Yoga for Kids Printable Poster. Open the PDF file and print. When printing, select “Fit to printable area” (or similar) to ensure the page fits with your printer type and local paper size (these have been created at A4 size). Giselle Shardlow is the author of Kids Yoga Stories. Her yoga books for kids get children learning, moving, and having fun. Giselle draws from her experiences as a teacher, traveler, yogi, and mom to write the yoga stories found in her Kids Yoga Stories store or on Amazon worldwide. Find her award-winning Rachel’s Day in the Garden yoga book here. You can also connect with Giselle on Facebook, Twitter, Instagram, and Pinterest. I love this poster, but with the flowers all over it, you may be alienating boys or maybe just their parents. One thought for a next version would be to show a boy as the flower and the butterfly and let the girl be a frog. Why keep stereotypes going? I can just hear my son rejecting this idea altogether because it is too girlie and I would love to hang it on our wall. Maybe also a garden gnome or something that could appeal to different audiences. Again, I love the idea and only say this because I don't think it will work in my household of boys and I wish it could and that we could start breaking down some stereotypes. Thanks for the free poster print outs. They are great for my preschoolers! Much appreciated. My grandson will love these. All boy who stops to smell the flowers too.